Entertainment - Stage Acts - Walkabout Acts! Multi-Morphic Hooping: A UNIQUE style created by the Hoop Hooligans blending technical illusions and amazing visuals, with the art of Native American Hoopdance. This amazing and visually spectacular act uses up to 21 hoops locked together in shapes you must see to believe! Costume and act theme can be customized to any show. Contact me now for quote! Contact Juggling (Crystal Ball Manipulation): Mesmerizing, refined and polished! This classy act is an absolute winner for all kinds of events, I have performed this close up for celebrities including Will Smith, TV featured on ‘Keeping up with Kardashians’, countless Cabaret Shows and as a refined, highly entertaining roving character. 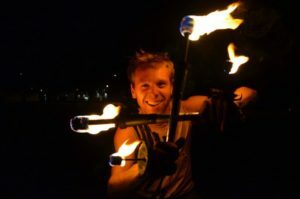 Fire Performance: MASTER fire artist with 10+ years experience, specialized in Fire Eating, Poi, Fire-Ropes, Double Staff, Clubs, and Dragon Staff. Experience the professional difference! SAFETY FOCUSED! I use a range of fire effects (sparkle powder, huge flame FX) and even stage pyrotechnics, all acts fully insured with Specialty Insurance. My HooperTrooper act is a full body LED suit used in combination with 4 super bright LED hoops, ultra glow poi, & crystal contact ball. The suit has over 300 bright, multi coloured LEDs creating a dazzling spectacle, sure to light up any environment. This act is extremely versatile, either on stage, or as roving/walkabout entertainment. Contact me now for a quote! 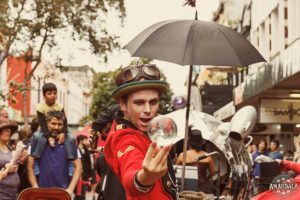 Rewi (pronounced re-we) is a New Zealand born, multi-discipline circus artist, performing Fire, Object Manipulation and Clowning. Now based in Los Angeles USA, he previously he spent 3 years on a global tour with the Hoop Hooligans performing their award winning show in 12 countries and visited many more. 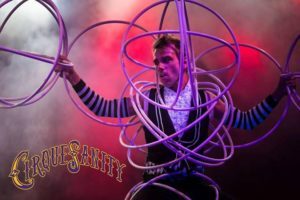 Through 10+ years performing many styles of circus; from contemporary theatre to traditional big top, corporate entertainment to music festivals, even Fringe festivals and street theatre shows, Rewi has cultivated a unique and mesmerising style. In this super-fun workshop Rewi teaches a multi level approach to the world of Mini-hooping including technical aspects of Object Manipulation (isolations, motion tracing, grid spacing). The class uses 1 through 4 hoops, teaching a wide range of skills and several Native American Hoopdance concepts that allow the student to progress with larger numbers of hoops. Contact Juggling is one of the most mesmerizing disciplines within the field of Object Manipulation. Rewi’s contact juggling workshop focuses on three aspects: Manipulation & Illusion theory, Isolation Skills and Body Skills. The workshop focuses on single ball, but Rewi teaches multi-contact in smaller focus groups. Combine the flow of Poi with the brain-bending geometry of batons? The results are extraordinary! Rewi teaches club manipulation basics through to advanced tricks. Clubs are an amazing way to expand your technical movement and unlock new patterns. This class will teach you everything you need to break into the wonderful world of club manipulation! Tag Cloud: Los Angeles Circus Artist & Specialty Act and Fire-Dancer, Fire-Performer, Fire Artist, Juggler, Hoop Dancer, Hula Dancer, Hoop Act. Rewi is available internationally. New Zealand Circus Performer, Circus Artist, Fire Artist, Auckland Circus Artist, Wellington Circus Artist, Hoop Shows, Crystal Ball Juggler, Unique and acclaimed performance acts.